Take a look at the items below. The numbers at each level represent the wholesale that must be ordered by the consultant during the quarter in order to qualify to get a prize at that level. So “emerald 3600” means the consultant must order $3,600 wholesale ($7,200 retail value) of product to get to that prize level. It’s easy to see how much some of these items cost. Below is the retail value I’ve found online…. the amount you’d have to pay from a typical retail outlet to get the item. You better believe that MK is getting the items at a fraction of that, probably less than half. But the bigger point is that many recruiters and sales directors will push consultants to get to the “next level”… but these prizes are wroth a tiny amount compared to the money that must be spent on products that will likely never be sold. Why Be a Star Consultant? I still can’t believe they’ll give a Christmas wreath as a prize. And what if it’s backordered as they’ve been in the past? Ladies buy your own prizes and save yourself from buying thousands of dollars worth of useless MK products. Y’all feeling me! I’m glad to hear I wasn’t the only one picking up on this…. It’s bad enough that the prizes are so tacky and overvalued. But the worst part is that when your overstated prize value exceeds $600 MK Corp issues you a 1099 tax form that increases your tax bill. You pay for the prize because your order’s supposed wholesale price is overstated, then you get to pay more tax as a result. What a deal. I just bought the LG TV offered for the Pearl level at BJ’s Wholesale on sale for less than $300. Figured it was on sale because they are phasing it out especially since the other LGs had much better resolution (but for a much higher cost). Besides, if I’m making “executive” income, shouldn’t I be able to afford my own private home theater … oh wait, that was the dream they sold me on, not reality. They’re phasing it out, so MK snapped up a whole truckload of TVs for, maybe, 25% of original retail price? Of course, the IRS Form 1099 they’ll issue you next January will show the full original retail price. MK knows better than to make waves with the IRS. And they have absolutely zero intention of providing you any paperwork saying they paid less than original retail price for the prize. Why, if MK did that you wouldn’t feel special any more! Smoke and mirrors. It’s all about appearances. Now you got me doing research… hmmm! Waverly can do it because she’s been taught by her Mom that bought a garage full of inventory to finish NIQ. The Fortenberry Area has notorious for finishing goals magically but then never showing up high on any scoreboards afterwards–a red flag for how legitly things were done. Bottom line: It’s all about shifting money from one person’s credit card to another and to act like you’re dripping of diamonds. Kimberly has admitted to spending her entire commissions on prizes to get her Area doing something. Because the NSDs can assign consultants to units under them, they can make sure Waverley is propped up with enough producers to get and keep her status. Absolutely, Lazy Gardens. I wonder why NSDs Kimberly and Scarlett haven’t hooked up sister/daughter Krystal Hunsucker, then? I have always found this to be weird. Krystal actually lost her pink Cadillac for a period of time this year. That family gives southern and Texan women a bad name. Their attire alone is horrendous! And then they open their mouths. Kimberly posted her top offsprings’ numbers: Waverly beat Krystal by something like $130K in production. That’s gotta hurt! Looks like the kind of crap your old credit card rewards program used to give you.. oh and also.. not usually worth it there either. 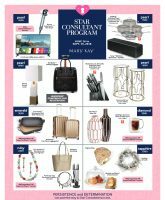 Any other director do what I did when the Star Consultant prizes were announced for the new quarter? I would hang the poster up on my training center wall and have each consultant come up and write her name with a Sharpie next to the prize she was “committing” to go for. Then throughout the quarter, I could give extra recognition at each unit meeting for a consultant getting closer to her chosen prize. I learned this at some stupid director training class, and I’m embarrassed that I even considered it, much less implemented it. I did the same! It’s what we were taught to do. And I hope I’m not offending anyone here, but those Pearl-level Florence Mirror Accent Tables are like something off the set of Boogie Nights. Phew! I’m over them now! Wonder if they put together awesome, unachievable prizes and then only obtain those by legally bundling efforts, blindly with downstream. In Canada, at 1800 there is a $25 digital meat thermometer, and at 4800, a $60 beach-shade tent that I’m fairly sure has been discontinued for several years. Top level 9600 Pearl – the choices are a jewelry organizer mirror or $400 pre-paid card. If the mirror retails at $250, then wholesale is between $150 & $180. They’d be crazy to take the merch over cash card at any level. But brain-washing is a powerful thing…. Have you seen all the Directors selling their prizes…even diamond bumblebees on Shani’s Office Directors’ Tips Page on Facebook? It’s like a garage sale these days. Bottom line: most directors are broke. Wow! As I’ve said many a time, if she’s not in a Cadillac, she’s not clearing more than $36K/year. Now THAT is the “Journey of the Broke”! Did “Shani” happen to be a MK sales director at one time? Anything to keep the donkey reaching for the carrot. She says you’re On Target…. It’s a very BIG target. Everyone fits on the target. There’s room for YOU on the target. In fact… you ARE the target. More precisely, your credit card is the target.